Being a fan of vintage Apple computers, I have always been looking for a modern way to build apps for 68k Mac directly from laptop without having to resort to ancient tools like Macintosh Programmer’s Workshop or Think C. Luckily my dream is realized when I came across Retro68, a GCC-based 68k cross-compiler that seems to be feature-rich and easy to use. I spent a few weeks exploring Retro68 various features and this article will share my findings. What is Retro68 all about? Developed by Wolfgang Thaller, Retro68 allows you to compile your existing 68k C code, with only minor modifications using GCC from your modern OS and run the generated binary files on your 68k Mac. After compiling the code, Retro68 will create a MacBinary image (.bin), a disk image (.dsk) as well as a Mac application package with resource fork (.APPL) containing the compiled executable which can then be copied over to your favorite 68k machine for testing. Retro68 is written in C and can be compiled for various platforms such as Linux, Mac OS and even Windows (with the help of cygwin), although Mac-compatible APPL application packages will only be generated if Retro68 is running on a Mac from a HFS/HFS+ compatible volume. The following sections will describe the steps needed to compile Retro68 on Ubuntu 16, my favourite Linux distro. Verify that all packages have been installed successfully. In particular, the autoconf package is critical. If it is missing, compiling Retro68 will fail towards the end of the build process (which may take between 30-60 mins even on a fast computer). The output may also display some cryptic error messages that could confuse you for a while. UPDATE: This issue has been fixed in the latest release of Retro68 (dated 12 April 2017) and the RayTracer sample application should build properly. 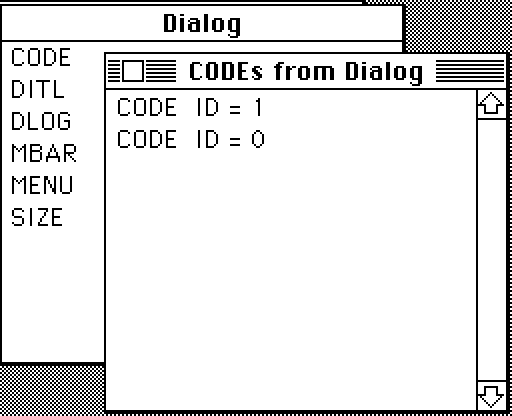 The following is the HelloWorld sample console application, also running on pce/macplus. 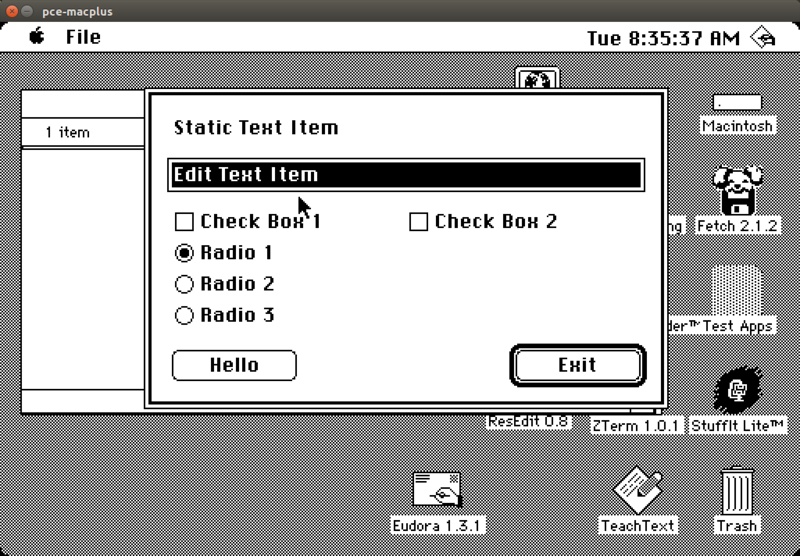 The app was built using libRetroConsole, a library by Retro68 that supports basic console functionality. There was no support for developing console application in the original Macintosh design as apps were supposed to be GUI-based. Retro68 also generates a 1.44MB HFS disk image (.DSK) that can be written to a 1.44MB floppy disk (for example by using dd) to facilitate copying of the compiled application. On older Macs that do not support 1.44MB floppies, you can use the MacBinary output (.bin) for file transfer instead. Adding more .c files to the application requires modifying the make file to include these new files. Obviously it is not necessary to include the header files (.h) in the make file, however. The output will then be created in the build folder. Retro68 uses Rez, an implementation of Apple’s Rez resource compiler which reads the .r files and compiles them to binary resource files whose names look like ‘dialog.r.rsrc’. These resource files will then be bundled together with the binary output from GCC to create the final Mac application. The text resource format has also been changed, resulting in cryptic error messages (for example, incorrect number of parameters) when using an older resource file. To fix this error, check the various resource header files in the RIncludes folder as well the sample applications from MPW 3.5 and find out the expected format. Retro68, on the other hand, uses GCC which has 32-bit absolute addresses and does not need to stick faithfully to that part of the 68K Mac architecture. It simply places most of the code into a single segment and uses some custom code to make all those addresses point to the right places once the code is loaded. The Retro68 code responsible for this can be found in libretro/relocate.c. There are only two segments, and most of the code can simply be put in CODE 1. The MPW architecture of segmenting via #pragma segment is no longer needed, and will simply be ignored by GCC. On a side note, if your CODE resource has an extra segment with ID = 256, like in the following screenshot, your 68k Mac OS installation is most likely infected with the nVIR virus and you should use a virus scanner software such as Mcafee Virus Scan 101 to clean up the infection. In my case, the virus could have come from one of my downloads on MacGUI. Applications created using Retro68 should only have two code segments having 0 and 1 as their IDs. Error of type 15 is “Segment Loader Error” according to this, which perhaps indicated the same thing, out of memory while loading the application. Clearly memory was not an issue, so what had gone wrong? These values mean that the application needs a minimum of 23KB, and prefers at least 35KB of memory to work properly. When more codes are added without these values being changed, the app will no longer work properly because Finder won’t allocate enough memory for it. Setting the above values to at least 100KB each fixed the issues for me. After testing the generated binaries on my Macintosh SE running System 6.0.8, I tried to run the compiled app on my Macintosh 512K with Mac OS 3.2 (Finder 5.3) and received the message “A system error has occurred” with ID = 10 indicating that the app attempted to access a non-existent ROM routine or something like that. After some debugging, it seemed that the error happened even if the app only contained a single return; in the main() method, so the problem must have been somewhere inside the bundled codes that were called even before execution reached the main() method. But where exactly? The script forces a rebuild of the sample applications, which will then rebuild libretro and other related libraries. After that, the output file libretrocrt.a is copied to the correct folder expected by the m68k-apple-macos toolchain. This is needed otherwise the build will continue to use the old libretrocrt.a library file for building. I submitted the above code change to the author, who integrated it to the latest release of Retro68 (dated 12 April 2017). With this, apps compiled using Retro68 should work fine on the Macintosh 512K (or even the Macintosh 128K), provided that they do not make any other function calls not compatible with old ROMs. An issue which remains is that console apps built using Retro68 will not work on the 512K. The compiled app size is bigger than the 800K floppy disk (almost 912K due to the added library size), and even with the HD20, it will fail to run (not enough memory). According to the author, the culprit is libstdc++ huge implementation of locales, which get pulled in all the time in new versions of GCC, even though those codes are never really used. Unfortunately, fixing this problem seems to be non-trivial for now. In one of my experiments, I received a linker error the moment I started to use the SerReset function (found in Serial.h) to initialize the serial port. A linker error also happens with OpenDeskAcc used in one of the MPW sample applications. This means that these functions are declared in the header files but not in the object files used during the link process, resulting in the linker errors. This is when I checked the original MPW disks and saw a lot of object files in the libraries folder, among which the Interface.o file contained the SerReset function which I was using. These libraries also contained a lot of other methods commonly used by other applications. Clearly Retro68 did not use any of these libraries. So how could most of the sample applications compile just fine? Unfortunately, with this implementation, many important API methods (e.g. File Manager, Device Manager or Quickdraw calls that are not declared as ONEWORDINLINE or TWOWORDINLINE) will not work unless glue.c is modified to include those methods, or the MPW .o library files are converted to a format accepted by GCC and included in the linker phase. For now, attempting to use any of the unsupported methods will result in a linker error. This is a known issue of Retro68, with no solutions yet. 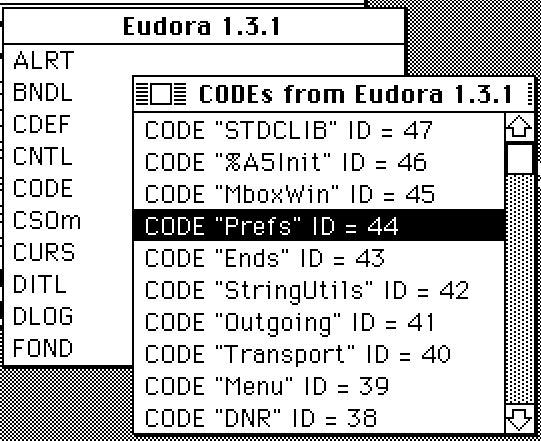 With just a few basic bash scripts to compile the project using Retro68 and run it in pce/macplus, I can comfortably edit my 68k codes using CodeLite. Even auto-completion is supported as well! For those who are interested, I will be preparing a VirtualBox Ubuntu image with Retro68, CodeLite, PCE/macplus and other necessary components allowing you to develop 68k apps the modern way. Stay tuned! Basically I developed bash scripts (.sh) to execute Retro68K commands to compile 68K Macintosh apps. I wrote various scripts for various actions like Build, Clean or Run. In particular, the Run script will create a disk image containing the binary output from the build process, attach it to PCE/macplus and start the emulator. In CodeLite, I create a C project and choose to run these scripts as custom actions for build/clean/run tasks etc. This way, CodeLite can function as a reasonable good IDE to develop 68k apps. 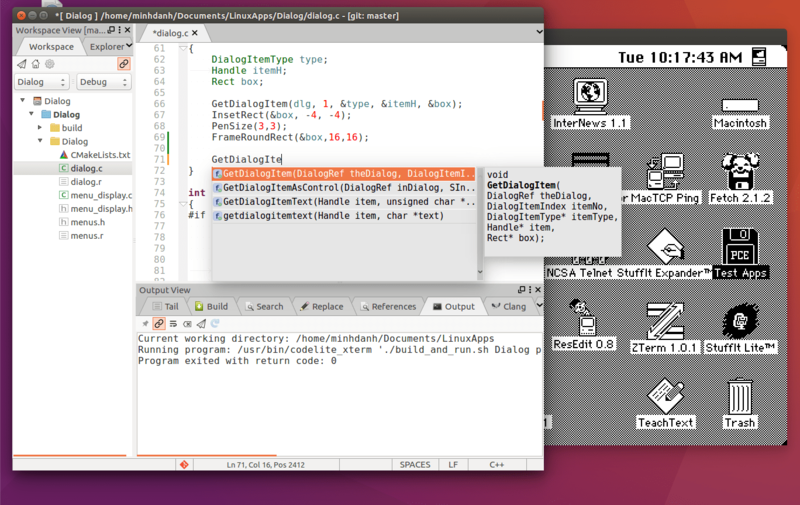 Except for debugging, other things work pretty well for me. I will try to write another article explaining more details this week. Fantastic article – really, no one seems to be delving into 68k Mac programming and I saw just recently system 6 heaven has faded away. He had a nice little section on development under system 6. I’m an enthusiast for programming on older macs, having done so decades ago, and am just curious what plans you have for your programming, any particular applications you’re working on? Forgot to mention, I recall Symantec did have a console application with their C++ compiler. Btw, are there 80s/90s Mac programming online communities or sub communities, bulletin boards or forums of any kind you’re aware of? My plan is to build a Ubuntu VirtualBox image with all the necessary tools so that people who want to play with 68k development can just download & try without having to go through all the rather complicated steps. Next step is to develop a text-based 68k browser that can run on System 6, using this https://github.com/clehner/Browsy as a starting point. I have thought of these for a while but haven’t got the time yet as I have been quite busy for the past few months. As for Mac programming websites, I often visit MacRumors, 68kmla and emaculation. Not to mention vcfed.org, which is not only for old Macs but also useful for hobbyist of other vintage machines, e.g. Atari, Amiga, Commodore, and early x86 PCs. I learned a lot about vintage computers from this site. Interesting to know that Symantec used to have a console application written in C++. I did try Think C and Macintosh Programer’s Workshop, but their IDEs are too archaic for me to use. If you have more information on the Symantec C++ SDK, let me know – I want to try it out. Thanks for the links – going to check them out now. Used to surf the web using an application called microphone LT on our Black and white Mac. Much better for whatever reason I can’t recall than zterm. I logged into a local UNIX text based ISP by modem. It actually was preferable for me than waiting for images to load. Anyway, though not technically a text based browser locally it had all the functionality of one. I don’t have much more to give you about Symantec Think C other than I believe it was version 6, the first version to support C++. I used Think C 5.0 primarily as well as Code warrior. It was only for console output from what I remember. Myself I’m thinking about getting back into it and writing games. Any news on the image yet? Any news on that virtualbox image? awesome. i have been getting into this and its a bit like if you crossed programming for old MS DOS systems with some kind of stripped down version of QT …. you have no memory protection, you constantly have to worry about running out of RAM, you can easily crash the system by accidentally hitting a null pointer, but you also have a ‘resource’ builder that can change your windows and buttons without even recompiling… a nice separation of interface and core program logic. its absolutely fascinating. The zip you provided with the headers is missing the libraries. The headers are meant to be used with the Retro68 SDK which has its own library format. The original MPW library files can’t be used, hence I did not include them in the ZIP file.